Gioachino Antonio Rossini (February 29, 1792 – November 13, 1868) was an Italian composer who wrote 39 operas as well as sacred music, chamber music, songs, and some instrumental and piano pieces. His best-known operas include the Italian comedies Il barbiere di Siviglia (The Barber of Seville) and La cenerentola, and the French-language epics Moïse et Pharaon and Guillaume Tell (William Tell). A tendency for inspired, song-like melodies is evident throughout his scores, which led to the nickname "The Italian Mozart." Until his retirement in 1829, Rossini had been the most popular opera composer in history. In his compositions, Rossini plagiarized freely from himself, a common practice among deadline-pressed opera composers of the time. Few of his operas are without such admixtures, frankly introduced in the form of arias or overtures. For example, in Il Barbiere there is an aria for the Count (often omitted) 'Cessa di più resistere', which Rossini used (with minor changes) in the cantata Le Nozze di Teti e di Peleo and in La Cenerentola (the cabaletta for Angelina's Rondo is almost unchanged). Moreover, four of his best known overtures, (La cambiale di matrimonio, Tancredi, La Cenerentola and The Barber of Seville), share operas apart from those with which they are most famously associated. A few of Rossini's operas remained popular throughout his lifetime and continuously since his demise; others were resurrected from semi-obscurity in the last half of the 20th century, during the so-called "bel canto revival." According to Herbert Weinstock's 1968 biography, the composer's estate was valued at 2.5 million francs upon his death in 1868, the equivalent of about 1.4 million US dollars. 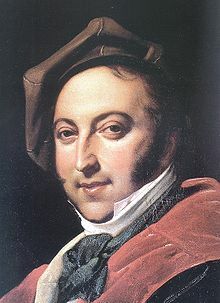 Click here to view all items related to Rossini.